Airbags are one of the most important advancements in automobile safety. In an accident, the airbag rapidly inflates to help arrest the movement of the driver and passenger(s). In a steering wheel, the airbag is mounted inside a housing. The airbag is concealed behind a set of molded plastic covers that need to work correctly and look good. Essential to this functionality is the cover’s tear seam. Airbag seams are typically 1 mm to 2 mm (0.05 in. to 0.08 in.) wide with a center thickness of 0.5 mm–1.5 mm (0.02 in.–0.06 in.). The cross-sectional profile of the seam can be flat on both sides, V-shaped on both sides, or flat on one side and V-shaped on the other. Their size makes it challenging to measure the seam’s thickness. The tear seam must be designed to resist accidental damage, tampering, and wear and tear over the course of many years. Some tear seams can be molded directly into the part or created after by scoring the seam using a laser or other tool. 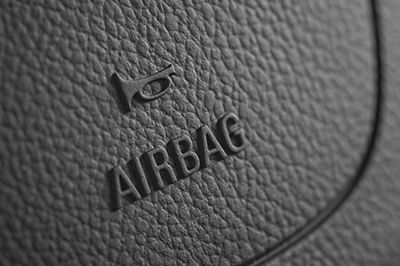 Once created, manufacturers carefully measure the seam’s thickness as part of their quality control process to ensure that it falls within specifications—if the seam doesn’t function correctly, the airbag may not inflate properly, or at all. Airbags are an important safety feature, and the thickness of their seams needs to be measured as part of quality control. The Magna-Mike® 8600 thickness gage works on a principle called the Hall effect. Hall effect sensors respond to changes in a magnetic field by varying voltage as an electric current passes through it. In thickness gaging applications, a Hall effect sensor is incorporated into a small probe along with a strong magnet that creates a magnetic field around the sensor. A target, such as a steel ball, bends the magnetic field. The closer the target gets to the probe, the more the magnetic field bends. As the distance between the target and probe changes, the voltage across the Hall effect sensor varies in a predictable way. This change in voltage is used to calculate the thickness reading. In this application, the probe tip is held on one side of the seam, and the target is placed on the other side—the distance between the probe and the target represents the seam’s thickness. Because of the seam’s shape, we created a special probe tip (86PR1-CWC) and target disk set (80TD1 and 80TD2) to help ensure accurate thickness measurements. The probe used in this application has a narrow, pointed tip designed to fit into the airbag tear seems. The 80TD1 target disk is sharp edged, and it’s designed to fit into V-shaped seams. The 80TD2 target disc has a square edge, making it ideal for flat seams. 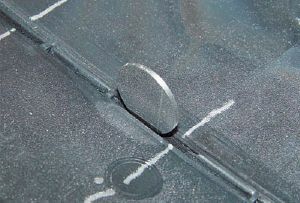 A chisel tip wear cap is ideal for airbag seam inspection. The target disk, in this case the 80TD2 designed for flat seams, is positioned on the inside of the seam. Before taking a thickness measurement, the Magna-Mike 8600 gage needs to be calibrated. When using the target disks for calibration, make sure that the target is lined up correctly with the probe tip. If the target is misaligned, your measurements won’t be accurate. When making measurements, the probe is usually placed on the outside of the airbag cover and the target disk is placed on the inside, making it possible to freely move the probe. It’s important that the disk remains aligned with the probe tip and that both the probe and the disk are in firm contact with the seam’s surface to ensure an accurate thickness measurement. With proper calibration and target disk orientation, you can expect a measurement accuracy of +/- 3% (or better). Measuring the thickness of a seam.